The government has set out the details of a new medal that will recognise the bravery and hard work of thousands of people who helped to tackle Ebola in West Africa. The medal is expected to go to over 3,000 people who travelled from the UK to work in high risk areas to stop the spread of the disease. The medal has been designed by John Bergdahl, who has been an engraver for over 40 years and recently designed a new coin set to celebrate the birth of Prince George. Mr Bergdahl’s design was chosen following a competition run by the Royal Mint Advisory Committee. It shows a flame on a background depicting the Ebola virus – above this are the words “For Service” and below “Ebola Epidemic West Africa”. The obverse bears a portrait of Her Majesty The Queen designed by Ian Rank-Broadley. The medal will be awarded to military and civilian personnel who have been tackling Ebola on behalf of the UK in West Africa such as people from our armed forces, doctors and nurses from the NHS, laboratory specialists and members of the civil service and non-governmental organisations. The first awards of the medal will be made as early as this summer and will be ongoing thereafter. The Prime Minister will also host a summer reception to congratulate in person some of the recipients. The Ebola outbreak was one of the most devastating epidemics of our generation but we managed to stop its spread thanks to the hard work of British people who travelled to West Africa. As a result of their efforts, many lives were saved and the outbreak contained. This medal is about paying tribute to those people. They put themselves at considerable personal risk and we owe them a debt of gratitude. 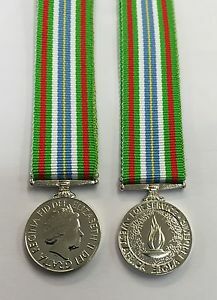 Manchester medals now has the ribbons in stock and can also supply the miniatures so if you would like more information then please contact us.